Last month, I posted a Anne Gomes’s video on twisting Japanese silk for hand embroidery. The other day, I had the opportunity to see some twisted Japanese silk up close, and the effect of this particular technique was really interesting! I thought I would share it with you, because I think it’s something that could be used with great effect in other types of embroidery as well. This is a pair of herons embroidered on a Japanese kimono. The kimono was bought some 70 or 80 years ago by a friend’s grandmother when she visited Japan. The ground fabric is silk, and the birds are embroidered in silk. They are beautiful and graceful, but unfortunately, they’re not quite all there! 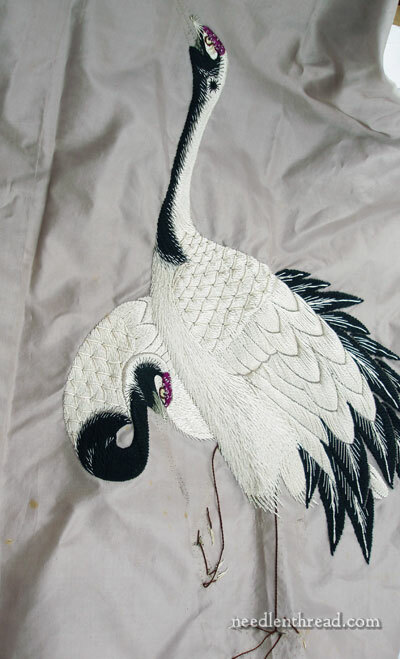 The kimono is falling apart (literally, shredding), and many of the herons embroidered on it are missing vital parts. But this pair illustrates an interesting use of twisted silk that’s worth looking at up close. It’s all in these neck feathers, where a light, feathery effect is brought about in this meeting of black and white on the heron’s neck. Notice how the black sketches over into the white, and the white sketches over into the black. How is this done? 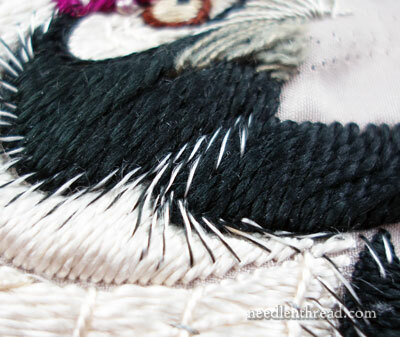 Black and white silk, twisted together, is worked in long stitches, over the “seam” where the white and black meet. Nice, isn’t it? From farther away, the effect is of feathery lightness and slightly prickly plumage. Up close, the technique that brought this rather complicated and precise look off is really somewhat simple in concept. I was fascinated by this, especially after having seen the video on twisting Japanese silk. It gave me some ideas for my own embroidery, and I hope it inspires you with some ideas, too! Thank you for sharing this. This looks like a wonderful technique to use on all sorts of things. It certainly creates depth. They’re absolutely beautiful, and what a great idea to get that feathery effect by twisting the silk colours together and then straddling the seam. Thanks for sharing. Pretty sure they’re not herons though – they’re red crowned cranes (aka Japanese cranes) and are symbols of luck and longevity I believe… although it sounds as though they need some help on the longevity front! Thank you for sharing this simple, yet very effective technique (and what an amazing design!) . . but you have left me intrigued on how they have stitched the black face/neck. It appears to be quite a thick thread or is it multiple threads twisted together and then couched? Would be pleased to learn more on this fascinating technique. It may be that Francoise has allready answered this question, but for those whose French is as non-existant as mine the head and neck are stitched in the following way. The flat silk has been made into a twisted thread (see the video), it is then stitched on a diagonal line (for the neck) using a satin stich, the diagonal moves with the curve of the neck to give a sense of movement. The face is stitched in the same way but on a different angle to follow the lines of what would be his feathers. This is a great demo. You can really see how little twisting there is of the thread, as the black and white show it well. I thought you had meant twisting it tightly, almost as tightly as floche or perle cotton, but it isn’t nearly as tight. Mary, this post is yet another example of how you enhance my embroidery skills. Thanks so much for sharing this. What a wonderful effect from something as simple as a controlled twist. Beautiful! Wow, that gives one multitudes of ideas! “In Japanese embroidery we use on flat silk made up of 12 (0r 16) suga that can be combined in many ways, the finest of 6 suga and the largest that I have used of 48 with possibilities to mix colors and metal threads. Some threads are used twisted for effect. to borrow what the kids say “sweet”! Really beautiful embroidery. I hope she will get this preserved. The birds are wonderful. The white crest on top and running to the neck looks padded with the twisted threads “laid” or satin stitched over it, giving the dimension. 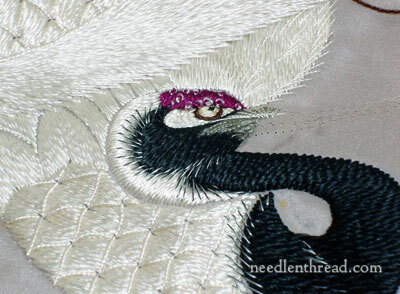 The black and white look like 1/2 strand each, black and white flat, threaded then twisted slightly in the needle to give the feathered look and soften the lines. I was taught to never blend colors in the needle, but this proves that, after you learn the skill, you can bend rules for a special effect. This is sort of soft shading. The crossed threads on the shoulders keep the laid long twisted threads in place, but I love the effect. Though geometric, it gives organic appearance and makes them look natural. Mary, I’d love to see close-ups of the chest of the bird where there is lots of shading. I’m sure there is a foundation under those stitches to give the contours of the feathers. Such simple, perfect colors. I love it. Thanks for showing it and, please, thank your friend, too. These are cranes, not herons. Cranes are a big deal in Japanese culture and have that red on the head.